I didn't like that film because it hung on a stupid conceit. Why didn't Tracy just mention why he was there in the first place? This is the perfect example of what Roger Ebert calls the Idiot Plot: the whole story wouldn't have taken place if Tracy had been marginally more direct about his intentions. Contrived" is the perfect word for this movie. That's a shallow criticism to dismiss a movie because the character doesn't act the way you want them to. This is a board that wouldn't exist if not for the mysterious stranger character for christsakes. Why don't the same rules apply to Harmonica or Mortimer or hundreds of other characters? I avoid drinkandestroy's posts because he hates movies for the most inane reasons (which is quite a statement round these parts). CASABLANCA IS TERRIBLE, WHY WOULD ALL OF THOSE CHARACTERS SPEAK ENGLISH. Because Harmonica and Mortimer need to keep quiet - their motive is secret for a reason and revealing it would get them killed. Tracy's character in this film has no such excuse. The point is that characters should act in a reasonable manner. And if they don't, then a movie is not believable. As I explained in my previous post, I disagree with Groggy specifically about this movie, cuz I think that Tracy's mysteriousness was warranted. But in general, I definitely agree with Groggy's point about Ebert's "Idiot Plot." Your comparison with Harmonican and Mortimer is just ludicrous. The point is not that every man has to in all situations explain his full reasoning behind all his actions. The point is that in a case where it makes sense that a man should be forthcoming,it is not believable if he acts all mysterious. It makes a lot of sense that Harmonica and Mortimer are mysterious about their backgrounds. It makes sense to me that Tracy does not fully explain his intentions upon encountering the suspicious-acting townsfolk. But if it doesn't make sense that he acts that way (which is how Groggy felt), then a movie is not believable. If you take your comment that you can't dismiss a movie because a character "doesn't act the way you want them to" to its logical conclusion, then I guess nobody can ever criticize how a character acts in a given situation, because you just have to accept everything as is, right? There is no room to argue with the reasonableness/believability of a character's actions, right? "CASABLANCA IS TERRIBLE, WHY WOULD ALL THESE CHARACTERS SPEAK ENGLISH." Yeah, that is precisely what i was thinking. I make no apologies for the fact that I want a movie to be believable at a certain level. At some point or another, virtually everyone here has mentioned the term "contrived plot," or some variation thereof. But I guess they are all wrong, cuz they can't expect characters to act "the way you want them to." Not only that, but instead of making nice to Tracy, hoping they can satisfy him so he'll go away, they antagonize the guy, ensuring that he'll hang around. WTF? The best way to get someone to leave is to politely answer all their questions and make a show of being helpful. And you don't have to say all that much. Japanese family? Oh yeah, they used to live here, but they moved away. Don't remember much about them. Nice folks, though. Sorry we couldn't be more help. Can we help you with your bags? Hour of the Gun - 7/10 - Well, after years of waiting to see this I was bound to be disappointed. It's not a bad film at all but it definitely feels like a TV movie in spots, with lots of dialogue scenes that drag the pace to a crawl. For a movie that boldly proclaims its historical accuracy at the onset, it makes some pretty obvious errors (Curly Bill and Ike's deaths). Still, it definitely has its merits: some nice shootouts, pretty scenery (when we go outdoors), a nice Jerry Goldsmith score and an interesting cast. I wasn't impressed by Garner, but Robards and Ryan pick up the slack. See if you can spot a young Jon Voight. Hour of the Gun is almost too literate and historically informed to be a western. It's one of my favorite westerns of the 1960s. I watched it again recently because I came across the soundtrack and had to buy it, and then I had to watch the film again. I'm very impressed with it. The writing is quite good, better than most westerns at the time, and it always has something to say. Extensive dialogue scenes were expected in American cinema when this film was made and do not indicate TV origins. John Sturges did not work in television. 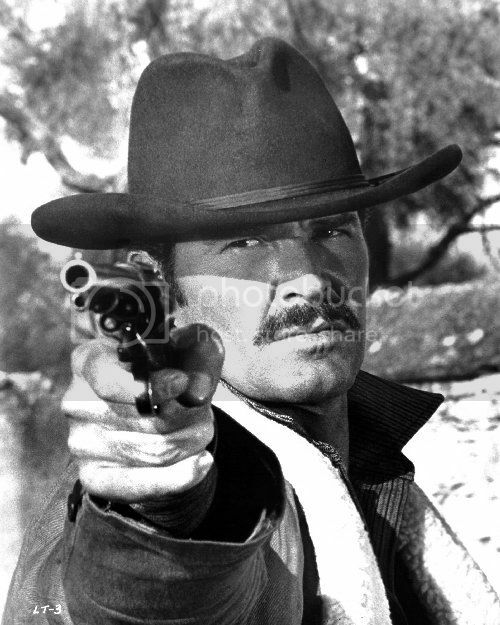 I quite like James Garner's atypical, stoic, steely-eyed performance. His Wyatt is a radical departure from previous Wyatts because he's conflicted, obsessive, seeking vengeance, crossing ethical lines like the national boundary he crosses illegally, and an all-around darker character than had been depicted before. Previous Wyatts were angels compared to this one. Doc Holliday always steals the show, and this time it's Jason Robards, who is superb. The direction by John Sturges is inventive, muscular, carefully choreographed, and classically composed. This is his best of several superior westerns. His decision to not use background extras invests the film with a visual austerity. To start with the gunfight and then show the social and political implications, and the personal cost of it, was a bold move in the 1960s. Somebody got the facts jumbled, but at least there is an honest effort to tell an historical story. Previous films about Wyatt Earp were pure myth. Hour of the Gun is a maturation ten years after the purely mythological Gunfight At the O.K. Corral (1957). 7.5 out of 10 is a relatively high rating and I think a fair rating for Hour of the Gun. I have two bookcases devoted to the history of Wyatt Earp, Doc Holliday, Cochise County, and the Tombstone A.T. conflicts, and I belong in the camp that says Wyatt killed Curly Bill. Or at least he sincerely believed he did. Ike Clanton was a vicious and sleazy drunk, a terrible business man, and a wholesale rustler and smuggler. Hardly the classy guy played here by Robert Ryan. I've always believed Robert Ryan, when he was a younger man in the 1940s or early 1950s, had the right personality to play Wyatt Earp. Kind of dour and ambivalent, but inwardly a decent guy. Physically he resembled Wyatt more than any other actor who played him. Right around the time Ryan played the heavy in The Naked Spur (1953) he would have made a perfect Wyatt Earp as written for Hour of the Gun. "I am not afraid to die like a man fighting but I would not like to be killed like a dog unarmed." William H. Bonney to Gov. Lew Wallace, March 1879. It really dominates the thread. Can't you shrink it in size so that it ain't so damned obnoxious? 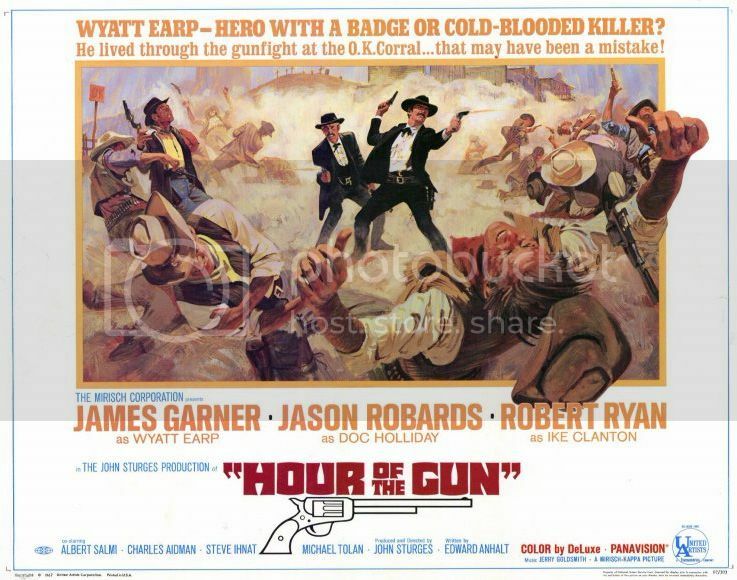 Nice write up Richard and a great Poster for "Hour of the Gun". One of my favorite Garner Westerns. Yeah that's a badass poster. The concept of the film is certainly interesting but I found it indifferently executed. It assumes a background knowledge of the Wyatt Earp story (which granted, most Western fans would have) and because of this, it doesn't bother to develop characters much. I didn't mind the courtroom scenes as much as some, but having Doc stop to heckle Wyatt about his callousness every now and then was pretty irritating. I don't normally critique films for historical inaccuracy unless it really bugs me, but a film that proclaims "this is how it happened" in its opening credits is asking for scrutiny. Certainly it's more accurate than previous Earp films but that's like saying the Pacific Ocean is deeper than a puddle. I will give it credit for not showing Morgan and Virgil shot on the same night, mistakes the two most recent Earp films made. no Westerns are historically accurate, no matter what they proclaim. 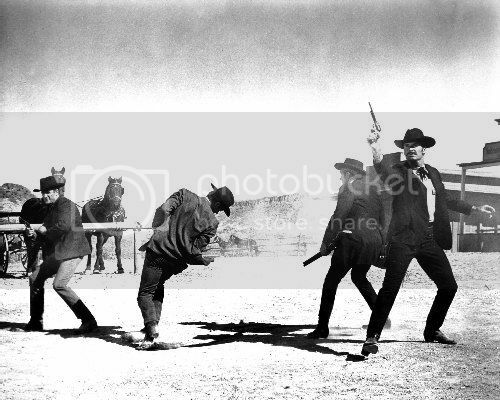 i mean, the Gunfight itself -- the incident that this movie is responding to -- was depicted in a purely fictional way. Sure, once it was depicted that way in GAOKC, it would have been dumb to depict it accurately in HOTG. But still, it was not historically accurate. But the whole point of it is to get up your nose. You've just given Groggy the satisfaction that the rest of us were denying him. If it makes the gentleman feel any better, I change my sig picture regularly. If not, I'll make sure to get a bigger one next time. How much cyber real-estate does your obnoxious photo use up? Right now it fronts more than 8,000 posts. 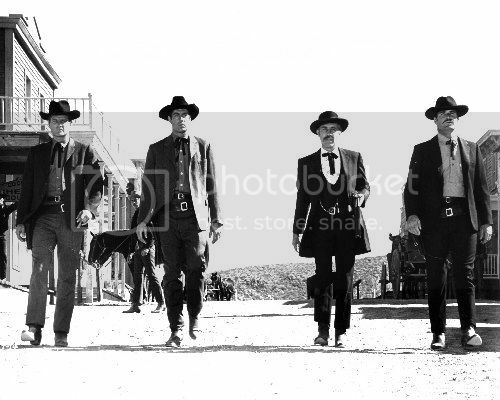 Which means it is more widely-disseminated on this forum than Sergio Leone himself, who would have shot you on sight for posting it in the first place. Do the website owners realize that you're using them to plug your favorite program at Sergio Leone's expense? 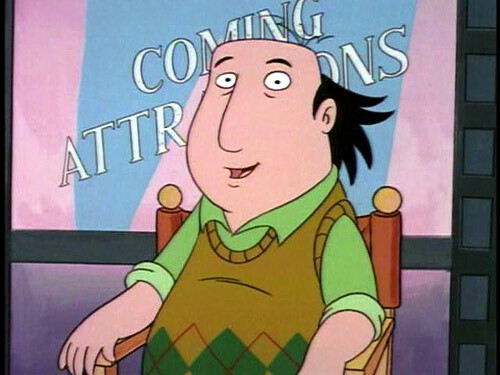 The nerdy film critic who talks gibberish about nothing -- is that what you think of everyone here?